Rushin Ballet is delighted to present our Easter concert. 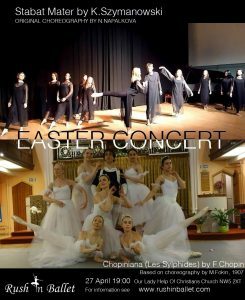 Les Sylphides by Chopin and original choreography of a religious hymn, Stabat Mater by Szymanowski. 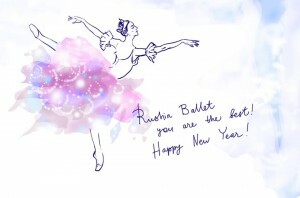 Rush in Ballet is a group of ballet enthusiasts. Practice in class is essential, but performing on stage is equally important to reinforce the skills and knowledge built during rehearsals. The first part will be Les Sylphides by Chopin. The choreography of the second part of the concert is inspired by HCS singing the beautiful Stabat Mater by Szymanowski. Choreographer Natalia Napalkova developed a passion for Stabat Mater by Szymanowski over the last a few years after her recent loss. “I could not resist the urge to create a choreography based on religious plot and to present it in our Easter concert that will combine classical singing, music and dance and we would love for you to join us”. In this Concert, we will integrate singing and dance and we believe that it can empower, inspire and motivate all ages through ballet. We can then assure you of an entertaining and enriching evening. The concert is on Saturday 27st April, at 7 pm at the Our Lady Help of Christians Catholic Church in Kentish town. Tickets on the day £15, Concessions and kids £3, Online £10. We will be delighted to give you a warm welcome.